A perfect pasta salad is bright and colorful, with a great mix of textures and flavors and just the right amount of dressing. With this easy recipe and great tips, I’ll show you how to make perfect pasta salad every time. 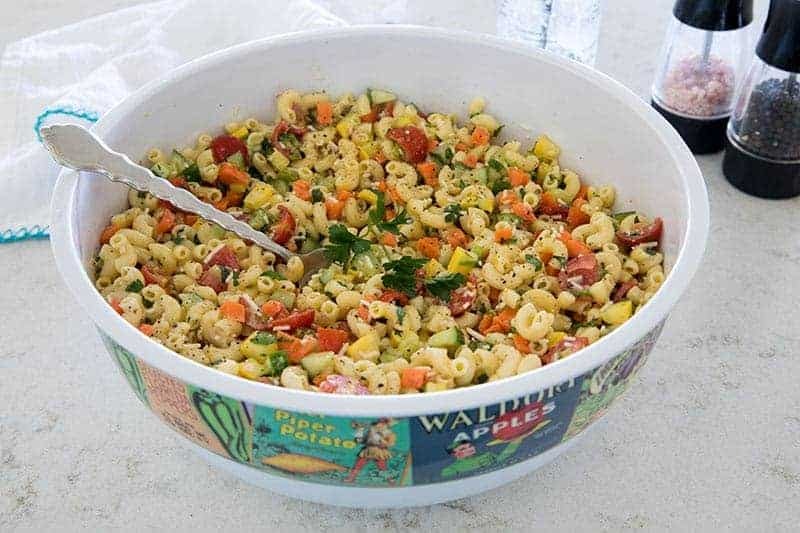 I love a great pasta salad loaded with fresh veggies and coated with a tasty vinaigrette, but I rarely made it because I had never been completely satisfied with the results – until I found an article, Five Steps to Perfect Pasta Salad, on Allrecipes written by Pam Anderson. It lists the five steps you need to create a perfect pasta salad and it upped my pasta salad game. Since Pam wrote the article, Allrecipes updated the post slightly and credits a different author, but it’s got the same great tips. So with Pam’s five steps in mind I created an irresistible, perfect pasta salad that my family can’t get enough of. Step 1. Pasta. Use 1 lb. of pasta. I used a box of Barilla Elbow Macaroni. I boiled it as directed in a gallon of boiling water seasoned with 2 tablespoons of salt. Step 2. Key ingredients. You need to use 2 lbs. of at least 3 major ingredients. I used crookneck squash, carrots, cucumber, and grape tomatoes. The squash and the carrots needed to be cooked a bit before adding so that they were tender-crisp. You can add the vegetables to the pasta during the last minute of boiling or you can drain the pasta and then cook the carrots and squash for one minute. Drain but do not rinse the pasta and the vegetables. Pour them onto a large-lipped cookie sheet to cool and dry. Step 3. Intense flavors. Add 1/2 cup of a strong flavored ingredient. I used grated Parmesan cheese. Step 4. Onions & herbs. “No matter what else is in your pasta salad, always add three large green onions, sliced, or half of a small red onion, diced.” I add three green onions because I like the milder flavor. You also want to add 3 tablespoons minced fresh herbs and/or 2 teaspoons orange or lemon zest. I like to add both lemon zest and fresh parsley. Step 5. Dressing. Add 1 cup dressing to coat the salad. Although you can prepare the salad in advance, don’t add the dressing until 15 minutes before serving. Then your salad will have just the right amount of dressing. I love to use an easy-to-make Creamy Vinaigrette adapted from Pam’s recipe. Thanks to Pam I’m no longer intimidated by pasta salad. 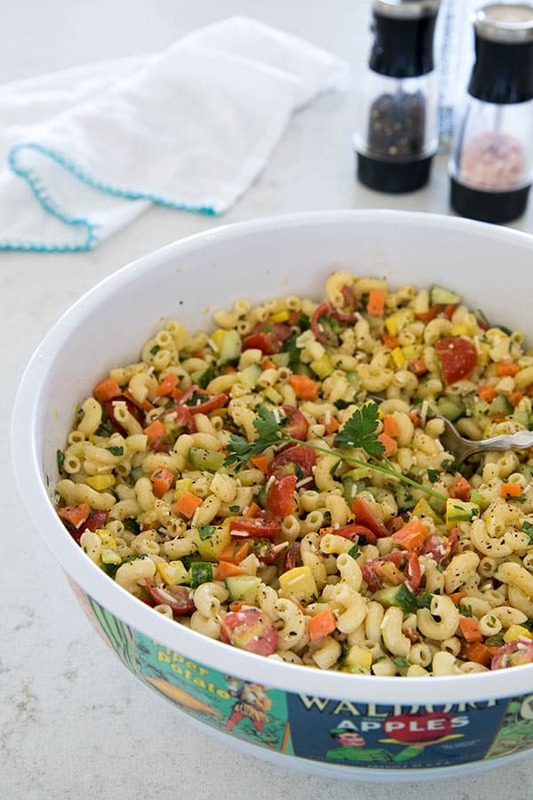 I make this traditional pasta salad all summer long. There’s also lots of great ideas and suggestions in the article, on making other kinds of pasta salads, such as Italian, Greek or Asian. Once you know the basics of How To Make Perfect Pasta Salad the possibilites are endless. Prepare pasta according to package instructions. (Make sure and add 2 tablespoons salt to the pasta water). Remove pasta to a rimmed baking sheet to cool. Don't discard the cooking water. Add carrots and squash to the boiling water and cook for 1 minute. Remove carrots and squash to a large mixing bowl and cool. Add cooled pasta to the mixing bowl. Add the cucumber, tomatoes, cheese, green onions, parsley and lemon zest. Stir to combine. Refrigerate salad covered with plastic wrap. Prepare Creamy Vinaigrette and refrigerate. 15 minutes before serving, pour over Creamy Vinaigrette over the pasta salad and gently stir to combine. Prepare Creamy Vinaigrette: Add lemon juice and mayonnaise into a 2-cup measuring cup. With a small whisk, stir in garlic, Italian seasoning, salt, and pepper. Slowly whisk oils into mixture to make an emulsified vinaigrette. What a great post. Pasta salad is a go to for me in the summer and the great thing about cooking is you can always learn something new! I love the new pic of you too! I could agree more. Thanks so much! I do enjoy pasta salad but hardly ever make it because most of the versions I’ve made just haven’t made the grade for me. I’m looking forward to trying your recipe-it looks so good and I love how you have all the proportions of each ingredient. That sure makes the whole process easy! Lemon zest- I would have never thought of that. Excellent post. I love making pasta salads and throwing so many different things in.